20 inch long necklace, threaded on strong Beadalon with a silver toggle clasp. 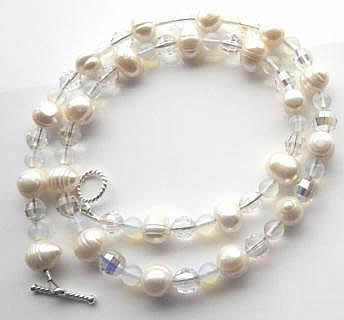 The pearls are irregular white10mm (varies) freshwater pearls, the crystal beads are 7mm round are reflective coated and the round opalite beads 5mm. Necklace has a really nice mixture of reflectivity from the various surfaces.